Volkswagen Group Research is testing automated vehicles in urban traffic in Hamburg. This is the first time the automaker has begun to test automated driving to Level 4 at real driving conditions in a major German city. 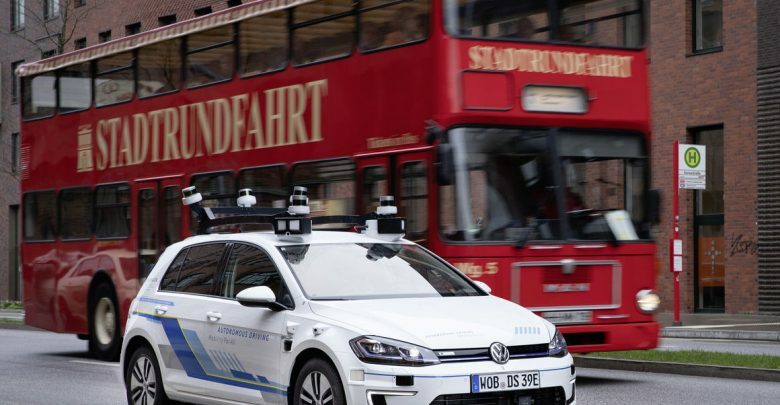 From now, a fleet of five e-Golf, equipped with laser scanners, cameras, ultrasonic sensors and radars, will drive on a three-kilometer section of the digital test bed for automated and connected driving in the Hanseatic city. The results of the test drives, which will be continuously evaluated taking full account of all data protection rules, will be incorporated in the Group’s numerous research projects on automated driving, and will test customer-centric services and optimize individual transport. A 9-kilometer digital test bed for automated and connected driving is currently being constructed in the city of Hamburg, with completion scheduled for 2020. To that end, the Free and Hanseatic City of Hamburg is successively upgrading traffic lights with components for infrastructure-to-vehicle (I2V) and vehicle-to-infrastructure (V2I) communication. Volkswagen and the city of Hamburg are thus taking a decisive step to further optimizing traffic flows through digitalization and to full-size implementation of automated driving in the city area. The e-Golf configured by Volkswagen Group Research have eleven laser scanners, seven radars and 14 cameras. Up to 5 gigabytes of data are communicated per minute during the regular test drives, each of which lasts several hours. Computing power equivalent to some 15 laptops is tucked away in the trunk of the e-Golf. This enormous computing capacity, combined with state-of-the-art sensor technology, ensures that data on pedestrians, cyclists, other cars, intersections, rights of way, parked vehicles and lane changes in moving traffic are captured over the shortest distances and in milliseconds. Despite the diversity and complexity of the information, the artificial intelligence used in the vehicle software must register all relevant objects and respond to them without triggering any false alarms. Several different artificial intelligence approaches are used: these include deep learning, neural networks and pattern recognition. Volkswagen Group Research is collaborating with all brands and relevant Group departments to enable the functionality of automated driving on public roads – right through to Level 5. The findings of this project will be successively incorporated in further research and development initiatives. The company aims to be in a position to offer customers concrete products for the automated transport of goods and passengers on public roads a few years from now. This will contribute to lasting improvements in traffic flows and road safety. However, automated driving without a safety driver in public traffic requires changes in the legislative framework and the availability of the necessary infrastructure.